The start of a new season demands an overhaul of the past. A fresh wardrobe or haircut is what people often turn to, but there are also subtler ways you can approach the idea of a brand-new style — changing your scent, for instance. Perfumes are bodily signatures that you have the liberty to change up. Each change says something fresh about who you are, or want to be. Since the season is spring, a fresh and lively scent is the right fit. Issey Miyake has the perfect scent for you, especially if you identify as a urban free spirit that thrives on the lushness of nature. Presenting the L’Eau d’Issey Pure Nectar de Parfum, its latest release which ensures, with a couple of spritzes, that you smell like a garden ripe with blossoms throughout the day. The new L’Eau d’Issey Pure Nectar de Parfum. 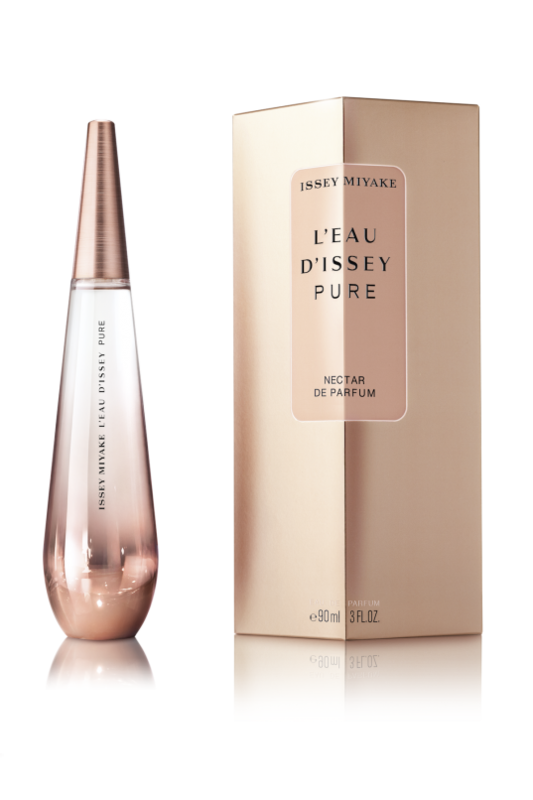 The L’Eau d’Issey Pure Nectar de Parfum is the third fragrance in the d’Issey Pure series. Its predecessors, the L’Eau d’Issey Pure Eau de Parfum and Eau de Toilette, told stories about the scent of water, and translated into vibrant summer scents the mineral sweetness and salinity found in different water bodies. The L’Eau d’Issey Pure Nectar de Parfum, on the other hand, is an expression of evolution. It looks to spring, and derives inspiration from the lushness of blooming flowers that give forth precious drops of nectar. Developed by Fanny Bal and Dominique Ropion, this floral, woodsy composition will seduce the soul of any free spirit, and lovers of lively scents. Top notes of warm honey and pear accord tease, then segue into the freshness of roses kissed by morning dew. At the base of the L’Eau d’Issey Pure Nectar de Parfum are hints of aromatic wood, such as ambergris, sandalwood and cashmeran. The bottle and outer packaging. 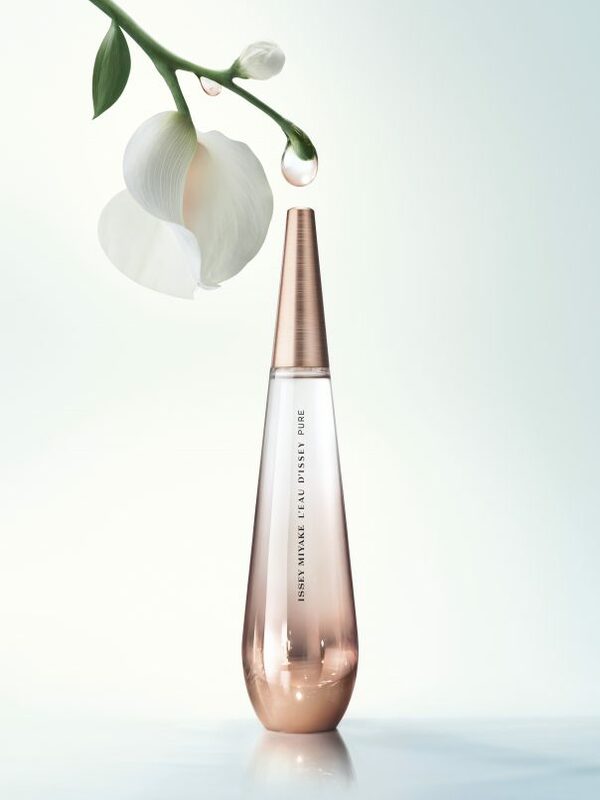 The L’Eau d’Issey Pure Nectar de Parfum comes in a drop-shaped bottle designed by Todd Bracher. Instead of a transparent glass vial, Bracher chose to enhance the Nectar with a seductive rose gold glow and cap, keeping in line with the theme. Wearing this perfume will put you in touch with your inner bohemian, so it’s only natural you’d want to preserve that for as long as possible. Be sure to spritz on your pressure points, but don’t rub the perfume in. Let it air-dry, as bodily friction can accelerate the breakdown of the perfume’s notes. Another tip to prolong its delicate bouquet is to apply an oil-based moisturiser to your pressure points before dousing yourself in perfume. The lotion acts as an occlusive, trapping the scent on your skin for a longer time. This way, you’ll smell like a rose garden all day. The Issey Miyake L’Eau d’Issey Pure Nectar de Parfum is available at major departmental stores and Zalora, priced at S$88 for 30ml, S$140 for 50ml, and S$173 for 90ml.